In the year 2000 IBM showed off the WatchPad, a computer on your wrist, but one perhaps ahead of its time and still needing a little bit of design-love. Of course, we love highlighting beautiful design when it does finally come along, and in the last few days the beautiful Pebble smartwatch has appeared over the horizon. As well as being “just a watch” with a long-lasting e-paper display it has a Bluetooth wireless connection, opening up all sorts of possibilities for expansion; particularly showing notifications, SMS messages, or status and calendar updates without having to check a mobile phone directly. Once it’s on your wrist the possibilites are there for all sorts of apps (not just fancy clocks!). In under one week they’ve raised $5 million in pre-orders from 35,000 individuals—taking the Kickstarter record for the largest amount raised through crowd-funding. A finished product does not just happen by itself, it requires lots of expertise; industrial design for the water-tight casing, ergonomics to make sure it fits on your wrist, electronics layout design for the battery, buttons and e-ink screen …and some firmware (embedded computer software) to make it all work. Andrew Witte (second from the left in the dream team) is the Lead Engineer working on the firmware and an Ubuntu fan. Andrew’s desk on a typical day has a sprawl of cables, a Lego car, some low-level JTAG programmers, USB prototyping cables, several half-finished Pebble boards …and, in the middle is Xubuntu (Ubuntu running with an XFCE desktop) for the development and debugging. Lots of open source is also being used to make the watch tick. The firmware development toolchain is CodeSourcery GCC for compiling, OpenOCD for working with the JTAG, and GDB (the GNU debugger) for finding all hard to solve bugs. One of the main parts of the Pebble is the Bluetooth interface for talking to smart phones, for which many hours have been spent testing with Ben Lam’s Python-based ‘LightBlue’ framework and utilities like hcitool. If that’s all getting a bit technical, Andrew notes that The Gimp and ImageMagick (both in the Ubuntu Software Centre) are used for processing the bitmaps and pictures before they are sent to the Pebble watch prototypes. 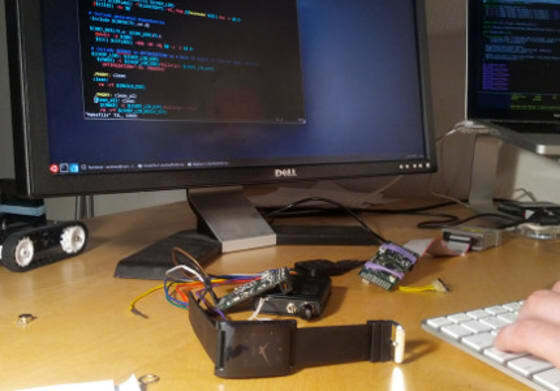 The race is on for the first person who can get a prototype in August 2012 and integrate Ubuntu’s libnotify-osd work with the Pebble watch, in time for Ubuntu 12.10 in six months time! For those with a pre-order, it will be possible to vote on additional-colour in addition to Artic White, Cherry Red and Jet Black. We’re hoping that Ubuntu Orange wins! 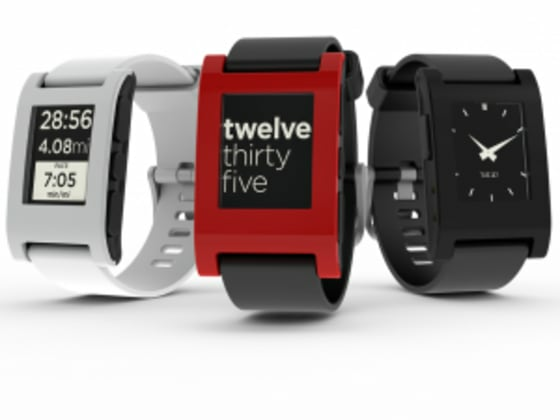 The Pebble Kickstarter campaign runs until 18 May 2012. To vote later for a colour (such as Ubuntu Orange!) you need to pre-order in the colour-Pebble category ($125+shipping).